Special Containment Procedures: SCP-660 may be safely stored in a standard locked safe-deposit box, provided its mouth remains covered with an inert Perspex disc and sealed with affixed tamper-proof strips. SCP-660 may be checked out for testing and research with the written approval of staff of Level 3 clearance or higher. Human testing of SCP-660 is discontinued. Description: SCP-660 is an irregular earthenware urn roughly 23cm in height and 28cm in diameter, with an opening 20cm in diameter. 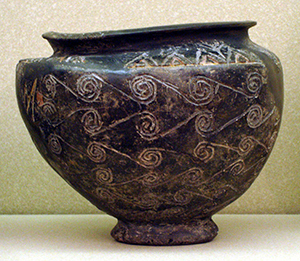 The composition of SCP-660 is consistent with generic earthenware clays. The interior of SCP-660 is coated with dried mammalian uterine tissue similar to human endometrial lining. DNA testing is inconclusive. SCP-660 is capable of indefinitely preserving all biological tissue placed within it, regardless of external conditions or the state of the sample, until the tissues are removed. Living tissue will remain viable, and living organisms will remain alive, even when deprived of sustenance for extended periods of time. While the exact mechanism responsible for this is uncertain, isotopic labeling has shown that it involves the exchange of biological matter between the sample and SCP-660's interior coating. Cell cultures from tissues preserved in SCP-660 retain an abnormally high rate of cell replication; several samples have tested positive for precancerous markers in smear tests. SCP-660-1 was a human fetus originally found in SCP-660, most likely having been sealed in the artifact for at least 6,600 years. However, SCP-660-1 immediately underwent massive transformation upon removal, additionally developing several █████-████ █████████ consistent with Anthropogenic ██████-Progression. SCP-660-1 is most likely neutralized. Details are available to personnel with Clearance 4/660. Recovery: SCP-660 was originally recovered from an archaeological dig in ████████, ██████, where it was found in a purported gravesite among a number of other mundane artifacts. A beeswax seal covering the mouth of SCP-660 was dislodged during the excavation process, revealing SCP-660-1. [DATA EXPUNGED], after which the site was secured by the Foundation. The notes of Dr. ████████ (presumed deceased) enabled the isolation of SCP-660 from the rest of the artifacts. Sample Condition: Skin flap harvested from the left thigh of the cadaver of D-612. Donor was healthy in all respects prior to death. Sample Use: Tissue sample left in SCP-660 for two months' duration. Sample Condition: Skin flap harvested from the left thigh of the cadaver of D-612. Sample Use: Tissue sample left in SCP-660 for two months' duration, then grafted onto the torso of a D-class personnel with second and third-degree burns. The recipient's anomaly testing record had no contraindications with SCP-660. Sample Condition: Live member of Mus musculus (house mouse), BALB/c strain, acquired for laboratory testing. By use of SCP-████, the consciousness of D-614 was implanted into the specimen. D-614 was chosen for his demonstrated resistance to the negative effects of prolonged isolation and sensory deprivation. Sample Use: Specimen left in SCP-660 for two months duration. Result: Unusually, SCP-████ was incapable of restoring D-614's consciousness to its original body after removal from SCP-660. A computer interface was developed to facilitate two-way communication with D-614. An interview was conducted once D-614 was familiarized with this interface; an excerpt is included below. Dr. Brown: I guess I'll have to take your word for it. And how did that feel? Dr. Brown: Could you be more specific? D-614: How the hell do you think it felt? Even mice need to grow and move and LIVE. Every part of me was straining, but I was stuck. I thought I would explode. Full contents of the interview are classified. An autopsy revealed precancerous growths throughout the mouse's body. Sample Use: D-778 was severely injured in an incident involving SCP-███. Lost limb recovered as part of cleanup operation. Subject would not have survived immediate reattachment surgery due to other injuries involving severe vascular compromise; severed extremity preserved in SCP-660 in bid to preserve tissue viability. Result: Right arm successfully reattached to previous owner. Subject reports return of sensation in fingers of right hand, contrary to poor prognosis due to severe tissue avulsion and nerve damage sustained in initial injury. Biopsy reveals little to no precancerous cell growth. Transplant ruled a (tentative) success. D-778 has been retained for further observation.